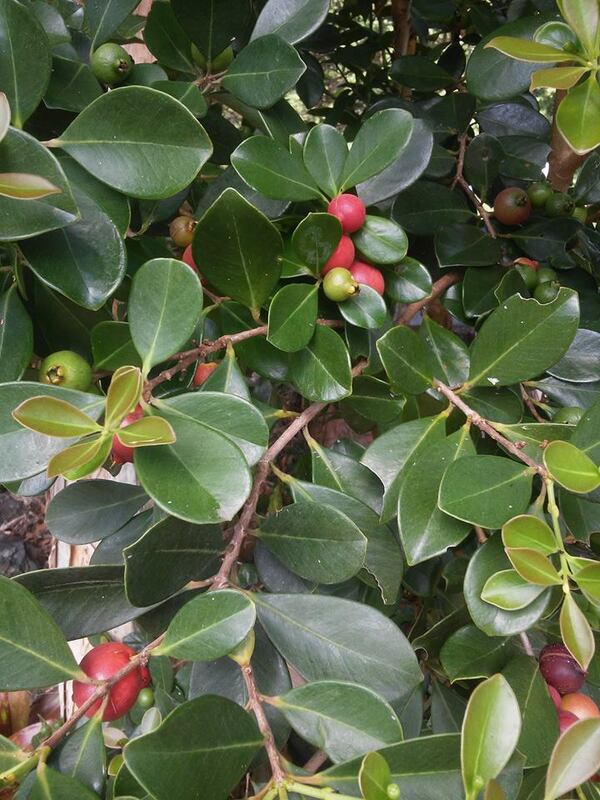 Psidium littorale var. longpies has many names including Cherry or Strawberry Guava. 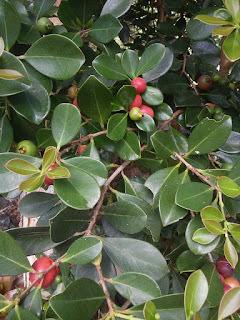 It is an evergreen shrub with glossy green leaves with quite a dense growing habit. The flowers are fluffy and white and appear in late spring and are excellent for attracting bees and butterflies to your garden. Pictured right, is the Cherry/Strawberry guava flesh and seeds. 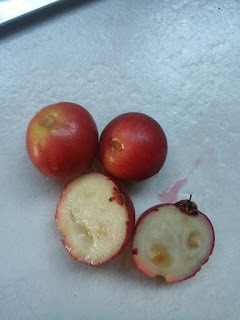 The seeds are quite small and they are not too unpleasant to eat - indeed it is hard to resist having a sample of this fruit when passing! 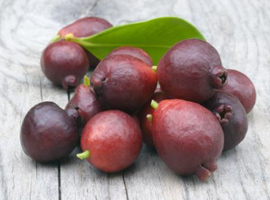 Their bright, soft red ripe fruit can be made into delicious jams, jellies, smoothies and desserts. It is important to note that this plant has to be grown responsibly here on the Coffs Coast as it has the potential to be an invasive escapee from our gardens. Birds really enjoy these fruits so it is best to net trees to limit their access to the fruit. Regular harvesting can be another strategy to prevent the spread of the seeds. It does make a very nice dense hedge however this application is not recommended for the Coffs Coast as the climatic conditions are conducive to their transported seed germinating freely in our bushland. 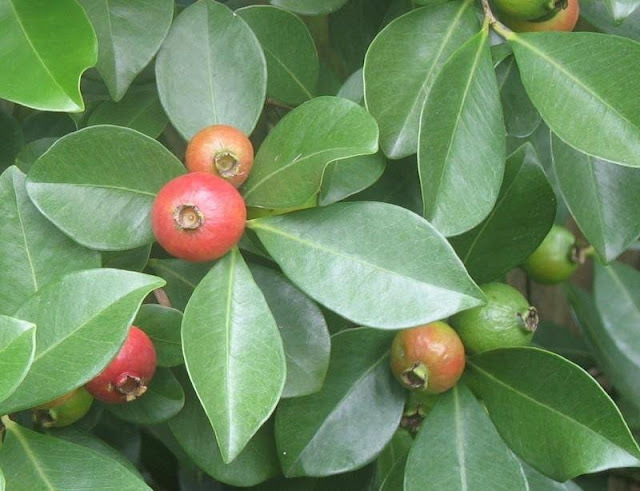 Cherry/Strawberry guava plants will grow in full sun to part shade and are quite hardy, tolerating cool conditions once established - having said that though they dislike hard frosts so perhaps not the shrub for cooler parts of our area like Dorrigo. This shrub can be grown as an attractive hedge and also makes a great container plant. To encourage healthy soil, leaf growth and fruit apply a good fertiliser around the root zone every 6 weeks and prune after harvest to help keep the plant tidy and compact. We have one shrub in our garden and it is a prolific 'fruiter'.